Last week I told Mr. Squash that I was "taking the week off". From what you might ask? After all, I'm retired! To be honest, I had to think about it myself! I came to the realization that I wanted a week off from pressing household chores to do whatever I wanted! Don't get me wrong, nothing is ever pressing around the Squash House, but Mr. Squash frequently tells me I work too hard! I never consider what I do hard work, but I'll take his word for it (wink)! What I decided to do on my week off was sew! I spent most of the week finishing up my "Roll On" quilt. I prepared to load it on Vinnie and realized the package of batting I had was not wool! Since this will be a bed quilt, I really wanted wool batting. Darn! 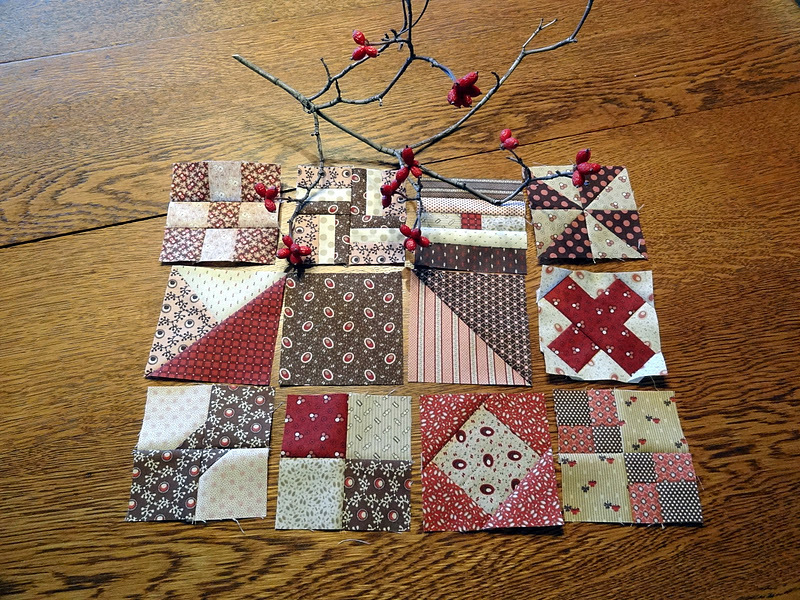 So to bide the time while I waited for my batting to arrive, I decided to participate in Temecula Quilt Company's 12 Days of Christmas. For each of the past twelve days they have posted a 31/2 inch block. Yesterday I finished day 12 and today they will post the setting for this little gem! I had a layer cake of Miniatures by Julie Hendrickson and was inspired to use it after seeing Kaaren's version of this! I thought the colors reminded me of our Dogwood trees in the winter. I snipped a small branch to try some "artful photography". I don't know how artful I was, but it helped jazz up my photo a tad! 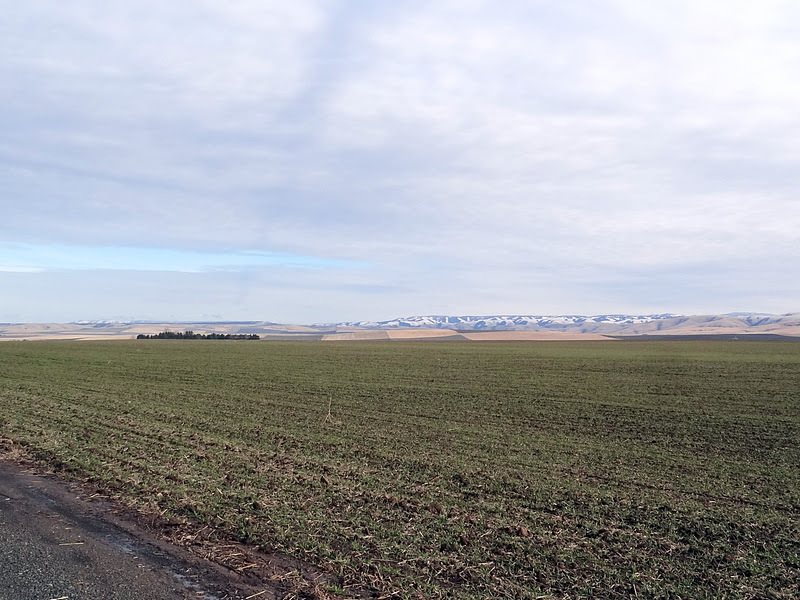 One of my days off was spent driving to Pendleton for the day with Mr. Squash. We stopped at the Woolen Mill store, the fly fishing shop and a handful of antique shops we had not yet visited. After lunch, we picked up mocha's at Starbucks and had a lovely drive home. Along the way I had to pull over and get this shot of the Blue Mountains with some fresh snowfall. Normally they would be covered in white all winter, but we've had a long dry spell. What you see here was pretty much melted by the next day. 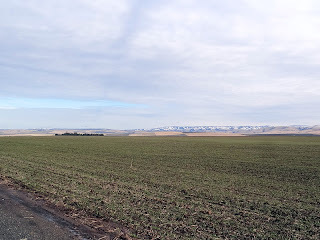 I love the contrast of the winter wheat against the mountains and sky. My batting arrived late yesterday afternoon, so I'll be playing with Vinnie for the next few days! Candace, I picture you as one of those folks who is so busy in retirement you wonder how you had time to work! So glad your days are filled to the brim, especially with some sewing. Vinnie was getting lonely, right? Love your picture....have fun playing!! Your blocks are beautiful! I love the branch, I think it looks artful. Have fun with Vinnie! Great job with the Christmas quilt. Taking some time for yourself is good! I just love your little blocks, Candace!! It's going to be a darling little quilt! I think the branch is fabulous. I noticed it right away!! Can't wait to see what you quilt up on Vinnie!! 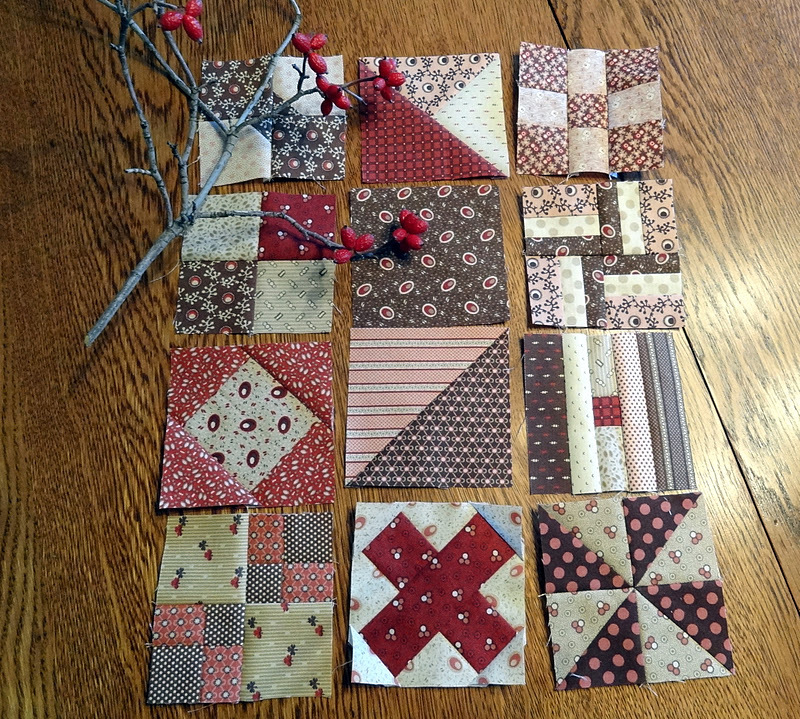 Love the colors in your 12 Days of Christmas blocks. Weren't they fun to do? I'm thinking of doing another one in red and white. Have fun playing with Vinnie. I'm looking forward to seeing your newest creation. 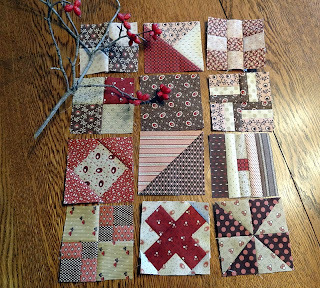 I too am on board with Sheryl's little 12 days of Christmas quilt. Just the right project to work on following the holidays. I am pulling from my collection of civil wars with mostly red,tans and cream. Like the fabrics you chose to go with. Happy New Year! Thank you for your devotion to your blog! I do love the colors in your cute little blocks. The branch added just the right zing to the photo. :o) Sounds like you and Mr. Squash had a day filled with goodness. 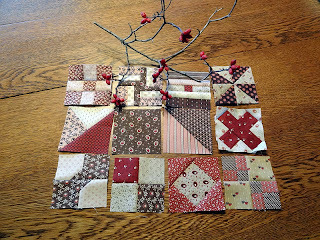 It's neat to see how many people are doing the 12 days of Christmas - Your wee blocks are looking great :-) I've just come from Carrie's blog after seeing the lovely pincushion you made her - just wondering if you mind if I borrow that idea for some of my sewing gifts this year? Sounds like a good week off! Can't wait to see your quilt when you and Vinnie get finished. I'm glad to hear you took a week off. I like the branch which you used to stage your blocks. You know, I"m not sure I ever saw a dogwood tree. I'm looking forward to seeing your 12 Days after it spends some time with Vinnie. You need to take more weeks off. You deserve it! I love the red & neutral colors together. So beautiful! And some time off to just be without doing anything pressing or urgent is good. We did that over Christmas as well. My friend just told me about the 12 days of Christmas project and then I went to your blog and saw your blocks. I love the colors you selected. It is going to be adorable. I think those are perfect ways to take a break. Sweet little blocks. I have been seeing them around on other blogs. Looking forward to seeing your quilt when it is finished. Oh, forgot to tell you that I really like your version of the Anna bag. Great handles. Didn't think I should enter the giveaway since I have so many bags myself.